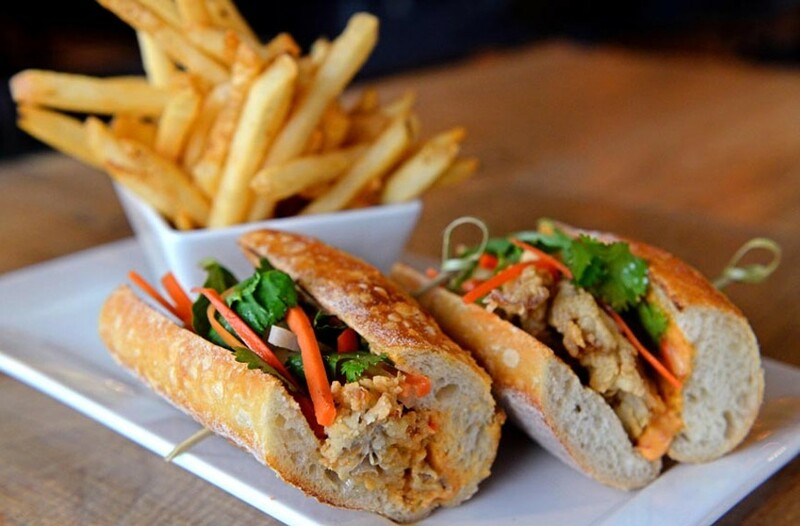 Scott Elmquist The Urban Tavern's po' mi sandwich, a cross between a Vietnamese banh mi and an oyster po' boy is composed of fried Virginia oysters, traditional banh mi toppings and a spicy remoulade. There’s a dining renaissance going on in the West End. Most notably, neighborhood diners have had Patina Restaurant & Bar’s inventive cuisine at their fork-tips since it opened in the late ’90s as Patina Grill, and nationally recognized chef Peter Chang landed in Short Pump two years ago — and it looks like he’s staying for good. But West End choices have been expanding lately. The Urban Tavern (10498 Ridgefield Parkway) snagged former Secco Wine Bar chef and Mosaic Catering and Events’ Tim Bereika, who brought upscale pub food to the far West End. Fries come with beer mustard, tomato-molasses barbecue sauce and buttermilk-herb sauce, and a bowl of mussels swim in a guajillo chili, tomato and beer broth topped with cilantro and a charred lime — not your average pub fare. A little closer to the city, in the old Graffiti Grill space at 403 N. Ridge Road, Manny Mendez and Johnny Giavos opened a second location of longstanding Fan District restaurant Kuba Kuba. The new place, dubbed Kuba Kuba Dos, has been a runaway success since opening its doors a few weeks ago with crowds eager to try an expanded menu that includes Salvadoran pupusas and a variety of croquetas. Not yet open at press time, nearby Backyard Grill (443 N. Ridge Road), aims to bring outdoor favorites like burgers, grilled chicken, barbecue and brisket inside to create a comfortable, family-friendly place to go when you don’t feel like cooking dinner in the heat.